‘Mezze Small Plates to Share,’ a new mezze recipe book by Ghillie Başan, dropped onto my doormat this week and as soon as I dipped into its pages I was transported into full-on feast of mouth-watering mezze. If you read my last post about Crete’s best eats you’ll know that I’m a big fan of Mezze so I was keen to get stuck in. The book is filled with moreish mezze recipes from the Mediterranean to the Middle East accompanied by some beautiful photography. A feast for the eyes, as well as the palate. Mazza in (Syria and Lebanon) is also known as Meze (in Turkey and Greece) but whichever way you spell it the word is derived from the Arabic ‘Maza’ meaning to ‘taste’ or ‘relish’. In Greece, the word comes from the longer form ‘Mezedes’ meaning ‘little delicacies. 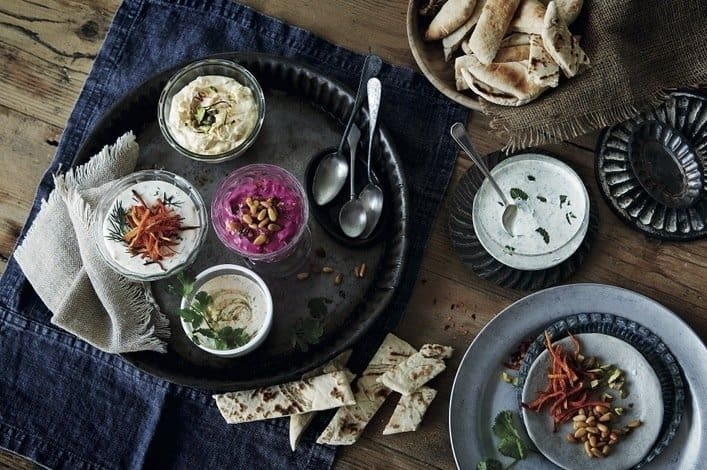 Mezze is a long-held tradition in the Middle East and Mediterranean and is the perfect way to share lots of small tasty dishes during a leisurely social gathering. Mezze can be enjoyed at any time of day, as a snack with just a few select dishes, or as a full-blown feast with selections of hot and cold, sweet and savoury, dips and flatbreads to ensure every last morsel is mopped up and savoured. The introduction to the book gives a fascinating insight into Başan’s travels around Turkey. The time she encountered an extraordinary feast of ‘hammam mezze’ with an animated group of naked women (you need to read it!) to ‘the moment that a mouthful of mezze changed the course of my life’. These are recipes with both heart and history and they’ll transport your imagination as well as your taste buds. ‘Mezze Small Plates to Share‘ is divided into five sections. Each section starts with a brief intro displayed on a background of beautiful authentic tiles. The short narrative tells a little about the recipes within, their origins and author’s insights. The food is presented on traditional Middle Eastern serving ware which adds a sense of place beautifully. After the introduction, the book covers basic mezze, then cold mezze which includes nibbles, dips and salads. The hot Mezze section is the biggest, serving up dips and purees, fried and sauteed dishes, pastries, pies, stuffed vegetables and fruit with kebabs and pan fries. There’re also some fish and shellfish recipes and a wide variety of vegetarian dishes throughout the book. There’s a sweet mezze section and to round off, there’s ‘After Mezze’. It’d be wrong to finish a mezze meal without raki, coffee or mint tea and this section has these all covered. The recipes are all very do-able with a few dishes that would take a little more time and effort. I’m really looking forward to preparing a mezze table next time we have friends or family round. To get a taste of working with the book I made ‘Hot Hummus with Pine Nuts and Chilli Butter’ from the ‘Hot Mezze’ section as I’d not tried a hot hummus before. It was very easy to make and I already had most of the ingredients. I halved the recipe and there was still enough for four. I served it with chunky bread and both Mr Jones and I loved it. I whipped it up in around 20 minutes plus cooking time. It’ll make a good sharing dish with friends so I’ll be making this again. I first had this heavenly hummus some 30 years ago in a tiny village near Kars in eastern Anatolia. Taking refuge in a simple, one-roomed dwelling after a hazardous journey through PKK (Kurdistan Workers’ Party) territory cloaked in darkness, the hot, creamy dip, baked in a clay dish, was as welcome as it was soothing. It was such a memorable discovery that I have been writing about it, and enthusiastically devouring it, ever since. When most people think of the word ‘hummus’, they think of the ubiquitous thick, smooth, chickpea purée served at room temperature with pitta bread or crudités, not this delectable, hot version, called sıcak humus in Turkish. I add yogurt to the traditional recipe to make it more mousse-like and utterly moreish. 2 x 400 g cans chickpeas, drained and thoroughly rinsed 2 teaspoons cumin seeds 2–3 garlic cloves, crushed roughly 4 tablespoons olive oil freshly squeezed juice of 2 lemons 2 tablespoons tahini 500 ml thick, creamy yogurt sea salt and freshly ground black pepper 2 tablespoons pine nuts 50 g butter 1 teaspoon finely chopped dried red chilli warm crusty bread, to serve Serves 4–6 Preheat the oven to 200°C (400°F) Gas 6. Instead of using a pestle and mortar to pound the chickpeas to a paste in the traditional manner, make life easy and tip the chickpeas into an electric blender. Add the cumin seeds, garlic, olive oil and lemon juice and whizz the mixture to a thick paste. Add the tahini and continue to blend until the mixture is really thick and smooth. Add the yogurt and whizz until the mixture has loosened a little and the texture is creamy. Season generously with salt and pepper and tip the mixture into an ovenproof dish. Roast the pine nuts in small frying pan until they begin to brown and emit a nutty aroma. Add the butter to the pine nuts and stir until it melts. Stir in the chopped chilli and pour the melted butter over the hummus, spooning the pine nuts all over the surface. Pop the dish into the preheated oven for about 25 minutes, until the hummus has risen a little and most of the butter has been absorbed. Serve immediately with chunks of warm crusty bread. Mezze – Hot hummus with pine nuts and chilli butter. Taken from Mezze by Ghillie Basan, photography by Jan Baldwin, published by Ryland Peters & Small. presenting the meatballs signifies that the new bride must be discrete about her new family. Fortunately, they weren’t too discrete to share the recipe! The Travelbunny is a participant in the Amazon Services LLC Associates Program, an affiliate advertising program designed to provide a means for sites to earn advertising fees by advertising and linking to amazon.com, amazon.co.uk, amazon.ca. Amazon and the Amazon logo are trademarks of Amazon.com, Inc. or its affiliates. Coming from a seaside town myself I couldn’t agree more! Oh yes – and Spanish tapas too! Mmm, that hummus recipe looks amazing – I’m definitely going to try it next time I have friends over for dinner. I am a big fan of “sharing” meals, there is something so lovely about sitting around a table piled with food. One of my favourite dishes is a huge pan of paella placed in the middle of the table in Spain – heaven! I know you’re not a big foodie Jo – I’ll have to find a book on the best walks in the world for you! One of my many favourite Spanish tapas is Salmorejo like Gazpacho but thicker more like a dip. Delicious. Spanish Tapas are delicious – I’ll have to try Salmorejo next time I’m in Spain. I love mojo sauce – I wonder if that’s similar?